Just as we predicted, only a week after releasing a new Sticky Notes update for Windows 10 Preview, Microsoft pushed the same patch to regular Windows 10 users. The new update brings a few functionality improvements and updates the version to v.1.1.24.0. The most notable change is the ability to resize notes to a smaller size. Microsoft decided to change the minimum Notes size mostly because a lot of users complained that even when resized to the smallest possible size, Sticky Notes still used too much space on smaller screens. The update also improved boot performance, which also was one of the commonly reported problems by users. Namely, users are not satisfied by Sticky Notes performance, especially on start up, so hopefully this update will at least solve this problem. As we said when we reported about this update a week ago, it may have fixed a few bugs and slightly improved performance, but there are plenty of problems still bothering users. For proof, look at Sticky Note’s Store page, where its overall rating is just 2.1. In order to make users fall in love with Sticky Notes (like they did in Windows 7) Microsoft will have to release many more updates and patches. The update is already available to all Windows 10 users, so if you haven’t received it already, go to the Store, and check for updates. Or, you can download the latest version of Sticky Notes manually from the Windows Store. Did this update make things better? 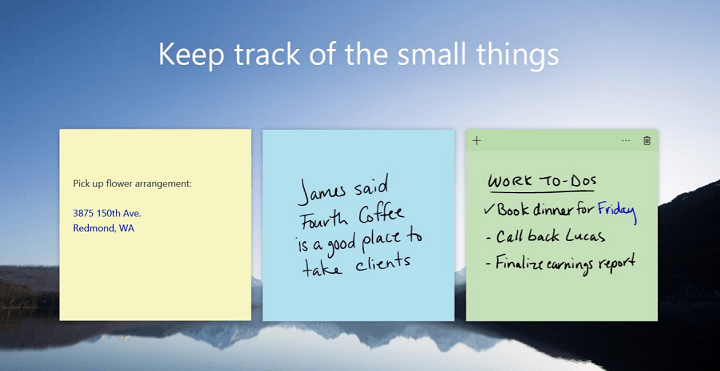 If not, what’s your biggest problem with the new version of Sticky Notes? Tell us in the comments.